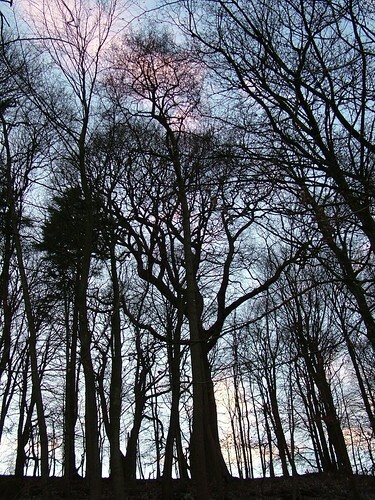 I’ll miss the Winter shapes of the trees once Spring is here. And yesterday while felling I disturbed some dead leaves and there was a Bluebell already sprouting about 2 inches tall. In a mixed woodland like Strid there is sucha diversity of trees and they can be appreciated so well here because of standing out against the sky. This is because Strid Wood is essentially a Ghyll wood. A Ghyll being a Yorkshire term for a steeply sloping V-shaped valley. Ghylls seem to be the main resource for woodland, presumably because the land was of little use for anything else. It does make management (tree felling) rather challenging sometimes in the steeper areas. The terrain is dead leaves covering loose brown soil with hidden stones and boulders (careful with that chainsaw Eugene!). This entry was posted in Slow, Spring by Flying Shavings. Bookmark the permalink.